I love my writing group! 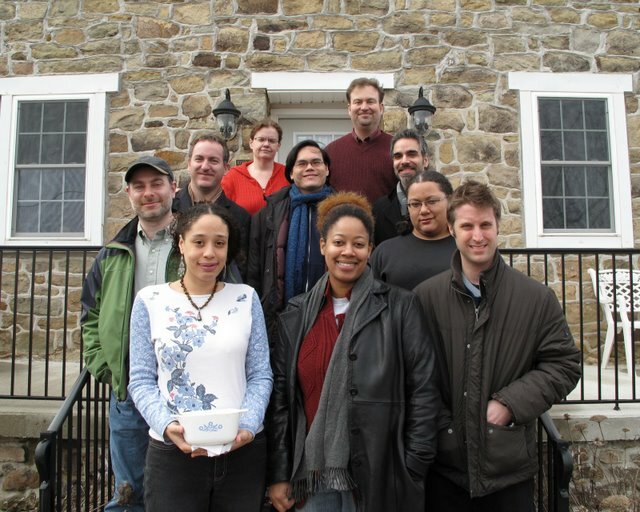 Last week we went on a retreat, taking over a farm in western Pennsylvania (near Gettysburg), where we spent 5 days doing nothing but writing and hanging out. I have to tell you, I’m not the sort of person who hangs out with a bunch of people easily for 5 hours, let alone 5 days, but this was worth gold. The retreat was kind of like hanging out in a co-ed frat/sorority house full of members who drink more tea than beer, cheer each other for finishing a thousand words, and consider cultural appropriation a more interesting subject than organized sports. We had impromptu communal dinners on two of the nights; I made chicken gumbo, which appears to have gone over well considering it was literally devoured down to a scrim of broth at the bottom of the pot. (I’d intended it to last a couple of nights, which necessitated some reshuffling of dinner plans for the future.) Because we were separated across two houses, which were actually pretty far apart, we ended up with two convenient subcultures: the larger house was louder and contained more people, but was internet-free, while the smaller house was better for the quiet-loving folks like me, and had internet (intermittently). I ended up shifting between the two quite a bit — the big house when I wanted to socialize, the quiet house when I wanted to get work done. The writing component of it was actually pretty tough. I went into the retreat with two goals: to complete the outline for Book 3 of the Earth and Sky trilogy, and to get a good solid start on the actual writing of Book 3. If I got bored or stuck I had a backup plan, which was to revise a short story that I’ve had on hold for about a year now. I didn’t think I’d get stuck, though. I actually have a very clear idea of what I want to do with the plot of Book 3 — finished the outline right off the bat — but my problem has been the voice. Books 1 and 2 have a female human protagonist dealing with the schemes of gods, and mortals who are playing god. I wanted to try something new for Book 3 — a male god protagonist dealing with the schemes of mortals. But although I’ve written four different test chapters so far — three from the male protag’s PoV, and one from a joint PoV between the male and female protags; about 10,000 words all total — none of them feel right. They’re good words, but they’re not the right words. So this weekend, after chatting with some of the folks in the group, staring at the stark Pennsylvania winter landscape, and doing some serious soul-searching, I gave up on my old idea, and wrote a chapter from the PoV of a female human protagonist. Lo and behold, it clicked. I blasted out 2000 words in about 2 hours — a record, for me. The protagonist now is essentially the story’s villain, and I’m going to have to write her as sympathetic enough that readers will cheer for her to succeed. Never done that before, so this is going to be a real challenge. I’m pretty excited about it. The sign of a good retreat (or Con) is that you feel a little bit sad and lonely when you return to the real world. It was quite the communal experience watching Battlestar Galactica together, btw. I got a kick out of the fact that everyone shouted out their reactions and theories — after each line of dialogue! Yes, very sad and lonely. It’s harder to be productive in my apartment now; I’m feeling a greater need to go out to coffee shops and the like, just to hear the same kind of energy and activity I had at the retreat. I loved watching BSG as a group, though. Looking forward to Raj’s get-together on Finale Night. Ah yes, I remember enjoying the spiced-up version at your birthday party last year. It was so good I wept (though the spices contributed). Sounds good, once it’s warm enough to hang on the balcony. Then maybe we’ll cook for you, given that we’ve each recently rediscovered our culinary sides: Hayley’s been making awesomely light whole wheat butter pecan pancakes and I made chicken kiev the other night!